“Is it over yet?” the young boy sitting behind me plaintively asked his father halfway through Act 2 of Alice in Wonderland. I could certainly sympathize. The Shaw Festival has obviously spent a lot of time, effort and money on creating a stage version of Lewis Carroll’s 1865 novel only to achieve nothing but a lumbering, dull and tedious spectacle. Even if you know the book, the direction by Peter Hinton is so confusing that key elements of the story go missing. Peter Hinton is credited with adapting the novel but he has not so much “adapted” it as transcribed it almost word for word as a script. This might be all right if the novel were inherently dramatic, but it is not. It is an episodic narrative in which much of the humour derives from arcane wordplay that modern readers, even adults, will need footnotes to understand. If you don’t know what a cucumber-frame, a conger-eel or a whiting is, too bad. As if Carroll’s story were not enough to tell, Hinton has added a frame to it that begins Acts 1 and 2 and concludes the play. This depicts the so-called “golden afternoon” of July 4, 1862, when Carroll and Rev. Robinson Duckworth rowed the three daughters of Henry Liddell – Lorina, Alice and Edith – up the Isis River in Oxford while Carroll made up the story that he would later write down as Alice in Wonderland. The main point to this frame, besides making us rather elaborately aware that the story is a story, is to create a Wizard of Oz effect where the people in the boat and those we see on shore later turn up as characters in the story. Jennifer Phipps, playing a silent old woman holding a cat, later appears as the Cheshire Cat and Carroll and Duckworth later turn up as the Mad Hatter and the March Hare in Act 1 and the Mock Turtle and the Gryphon in Act 2. The first of many problems is that the frame is so poorly managed that it leads to confusion in the rest of the story. We first see a group of Victorian people standing in a glade only to find that Hinton has the boat glide first behind them and then in front. So, is the group meant to be standing on the water or on an island or peninsula or is Hinton so keen to show off the rowboat that he does care if its course makes nonsense of the where the people are? Next the White Rabbit hurries by but, contrary to the most important part of the story, Hinton does not show Alice follow the Rabbit much less less follow it and enter its rabbit hole. Rather, a projection shows what looks the the background for Looney Tunes cartoons into which all sorts of tea things fall. Finally, Alice (Tara Rosling) is flown onto the stage. Not only is it unclear that she has followed the Rabbit down the hole but the world she has entered still has the people in Victorian costume standing about who were in the first scene. Perhaps Hinton is trying to show that Alice is descending into a dream while still semi-conscious of the world around her, but, sophisticated as that might be, it makes Carroll’s narrative, even for those who know it well, difficult to follow. Hinton doesn’t fully get rid of all these extraneous real-world people until after a song during the Mad Tea Party at the end of Act 1. At the end of the play we discover in the1862 frame that Alice has been asleep. The question is, “What exactly has Hinton been showing us?” Is the action supposed to be Carroll’s story that Alice is listening to or is it her dream? It can’t be both but that is what Hinton suggests. The Wizard of Oz effect of real people becoming fantasy beings suggests a dream. 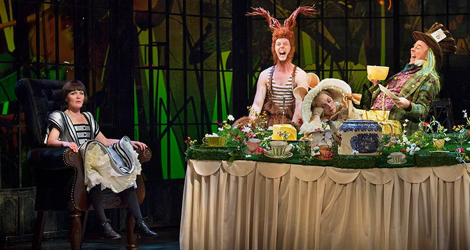 Alice’s begging Carroll at the start of Act 2 to write down the story suggests she is awake and listening. To make things worse, Hinton ignores Carroll’s own satire of the Duchess who finds a moral in everything and imposes a moral on the play. At the end, back in 1862, Hinton has Alice rush into the arms of her mother whom we now recognize as such for the first time (Moya O’Connell had previous played the Queen of Hearts) and exclaim, “Mother, I’ve grown up!” Since Alice is 10 years old, what bizarre meaning does Hinton imply. Is Alice somehow more mature? She seemed rather mature for a 10-year-old before. Has she grown from childhood to adolescence? And, is it Carroll’s story or Alice’s dream that is a metaphor for “growing up”, whatever that means? 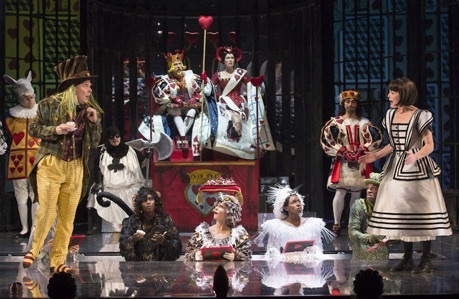 One might have thought that the Shaw Festival could have learned from Stratford’s tediously literal adaptation of Alice Through the Looking-Glass (1996 and 2014) by James Reaney that a nonsensical episodic narrative might be a pleasure to read but is not inherently dramatic. There is no conflict. Instead, Carroll gives us one scene after another of events that deliberately make no sense and that nonsense is heavily based on what was thought right and proper in Victorian England. When the Mock Turtle says that he learned “Laughing and Grief” at school, how many adults, much less children, are going to know he is punning on Latin and Greek? How many will even know what’s so funny about a Mock Turtle anyway, since mock turtle soup has disappeared from menus? Who will know why hatters and March hares were thought of as mad? With footnotes a modern reader can learn what Carroll is satirizing, but Hinton’s stage adaptation has no footnotes. Worse than all this is Hinton’s staging. Hinton uses animated projections not theatrical means to create all of the fantastical effects in the novel. Alice’s fall down the rabbit hole, Alice’s changes in size and the Pool of Tears are all created by Beth Kates and Ben Chaisson’s projections on the entire back wall of the stage or on a front scrim or sometimes on both at once. Alice’s growth to giant-size is especially confusing. A spotlight remains on Tara Rosling as Alice while a projection on the front scrim shows her growing. What are to believe is real, the person we see standing on the stage or the hazy projection showing her growth? Especially disappointing is Hinton’s depiction of the Cheshire Cat. The role is played by Jennifer Phipps, but she plays it only in projection (live or pre-recorded?) and the Cat’s lingering smile is achieved by animation. The point is, “Why take children to the theatre if all they will see there are movies?” A truly inventive director, like Peter Brook in his recent play Battlefield (2015), can create any number of fantastic events from Hindu myth through entirely theatrical means, and minimal theatrical means besides. Hinton’s over-reliance on projections throughout the show will make parents wonder why they didn’t save a lot a money by renting the classic 1951 Disney animated movie or the 2010 Tim Burton live action film. The Shaw Festival has commissioned Allen Cole to write a score featuring 19 songs to accompany the entire show. Rather than the bright, memorable songs from the Disney movie or a pastiche inspired by Victorian musical styles, Cole’s score is dark and dissonant, often like Prokofiev or Shostakovich, but without their accentuated rhythms. Not only are the songs unmemorable but they often occur at inopportune moments and slow down the already dragging action. When Cole needs choruses, Hinton brings on characters you thought had disappeared and only creates confusion. And yet, despite frequently unnecessary songs, Cole does not set the one poem most often excerpted from the novel – “You Are Old, Father William”. In a way quite unlike musicals at the Shaw Festival, the words to these songs are so muddy that its hard to know what anyone is singing about. The prime exception is the Mock Turtle’s song “Beautiful Soup”, the only song to evoke any mirth. Stuck in this elephantine production, the actors do the best they can. Tara Rosling does a heroic job in projecting Alice’s combination of curiosity, fear and outrage at the events around her – an offended innocence at a world that runs according to rules completely contrary to those in “real” world. Her performance is really the only element that gives the show any buoyancy. Graeme Somerville skilfully distinguishes his roles as the sensible Lewis Carroll, the manic Mad hatter and the melancholy Mock Turtle. Kyle Blair is so physically different as the Reverend Duckworth, the loony March Hare and the ominous Gryphon you might not know they were all played by the same person. Neil Barclay is amusing as the French Mouse, Moya O’Connell is suitably frightening as the Queen of Hearts, Donna Belleville is appropriately annoying as the aggressively witless Duchess and Jennifer Phipps would be even more captivating as the Cheshire Cat if we could see her do so in person. William Schmuck’s elaborate costumes sometimes follow John Tenniel’s classic illustrations for the original edition, sometime deviate from them. Alice does not have long blonde hair but rather wears her black hair in a helmet bob à la 1920’s star Louise Brooks. Schmuck’s Mad Hatter follows Tenniel but his March Hare wears suspenders and an athletic shirt and Dormouse sports a frilly bonnet. His costumes for the fish characters look more like stalks of white asparagus until they bend over to show the fish mouth out of which they have not been speaking. The court cards are so fussy in design that their most important feature – their suit – is the least noticeable. The one inventive depiction of a character unreliant on projections or complex costuming is the Caterpillar played by Jay Turvey as it head and five other actors as its legs that reflect Turvey’s gestures in sequential waves. If only Hinton had conceived of the whole show in such an inventive manner it might have made the show seem playful rather than ponderous. This Alice in Wonderland is a “golden afternoon” only if you think of gold as heavy and expensive rather than brilliant and sparkling. Photo:(from top) Tara Rosling as Alice, Kyle Blair as the March Hare, Patty Jamieson as the Dormouse and Graeme Somerville as the Mad Hatter; Graeme Somerville (far left), Tara Rosling (far right), Jay Turvey and Moya O’Connel (raised centre) as the King and Queen of Hearts, ©2016 David Cooper; Jay Turvey and others as the Caterpillar and Tara Rosling, ©2016 Emily Cooper.